Fundamental changes in American society after WW2. Mass production on a huge scale, orientated to mass preference, not elite direction, produced a culture which bore little resemblance to the pre-war version. And so insisting on a wider definition of what 'art' is. Instead of reserving the word for the noblest artifacts or ideas, it needs to be used more widely to describe what a society does. So instead of a vertical concept of culture, choose your personal interest. No reason why a Maria Callas fan should not also enjoy Cliff Richard songs. The American Pop Art movement emerged suddenly in 1962, much to the chagrin of the critics. All five of the artists who would become Pop Art icons - Andy Warhol, Roy Lichtenstein, Claes Oldenburg, James Rosenquist and Tom Wesselman - all had their first one man shows in NY. The critics thought it was a disaster bc it trampled all their values of painting as expression of ideas. But artists simply couldn't ignore the avalanche of new imagery erupting from advertising to the new consumer culture. From the govt down, the US wanted to encourage domestic spending to avoid a repeat of the Great Depression. So instead of spend to get what you need, it was spend to keep up with your neighbours. And the advertisers were there to encourage idea that that was the American Dream. Roy Lichtenstein was the most reviled of the Pop artists. Life magazine article 1964 "Is he the worst artist in the US?". To the critics he was attacking high art. A NYT critic said "he was making a sow's ear out of a sow's ear." But by the end of the 60's most observers recognized that he was engaged in quite a sophisticated exploration of contemporary art issues. Critics can't agree on Andy Warhol - was he celebrating American mass culture, was he criticising it, or was he simply observing it? He did reject the snobbish attitude of preceding generation who tried to ignore the post-war consumerist society and its images.Warhol never actually produced anything new - he simply reproduced the products of others. Vietnam the "living room" war - effect of TV making it both more and less real, in that it was also diminished by being shown on literally small screen, and in the comfortable surrounds of own home. 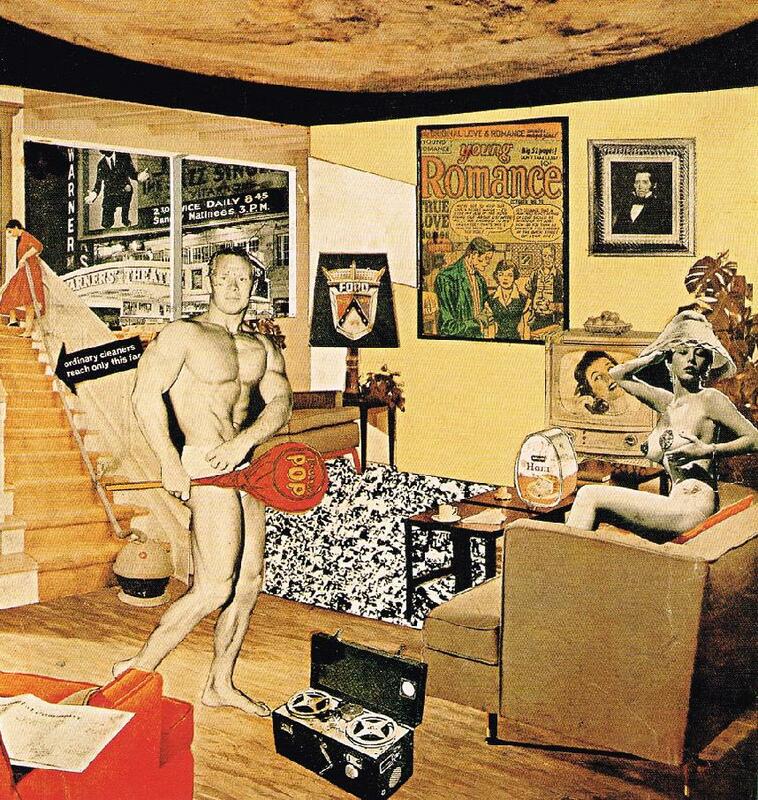 Richard Hamilton updated his 1956 Just What Is It That Makes Today's Homes So Different? in 1992 with Just What Is It That Makes Today's Homes So Different, So Appealing?, both thematically and technically. 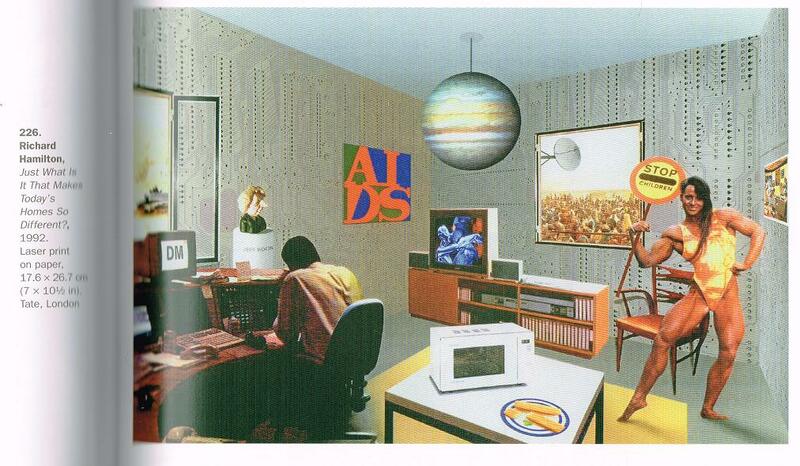 Used Paintshop to electronically collage images pulled from the Web which he then printed on a colour copier. Another room in a house. Through window can see a satellite dish, but also starving crowds in India. The LOVE poster replaced by AIDS. The male bodybuilder in original is now a female. Modern food science rep by microwave oven and frozen dinner. Warhol: "I started as a commercial artist, and I want to finish as a business artist. After I did the thing called 'art', whatever it is, I wanted to be an Art Businessman or a Business Artist. Being good at business is the most fascinating kind of art." Warhol hired Fred Hughes after his agents couldn't sell his paintings. Hughes started him doing portraits on commission at $25,000 each. Warhol eventually did over a thousand, mainly from his new social circle of glitterati from the art, fashion and show world. The portraits began with Warhol snapping polaroids while assistants darted around changing hair or cosmetics or lighting, intentionally mimicking a high fashion shoot. The selected image sent to a fine art printer who converted it into a proof the size of the finished painting, with all midtones removed. A studio assistant then used an OHP to trace the image onto a canvas and paint in the background. The painting then went back to the printer who silk-screened the photograph on to the dry paint. Warhol then might add a few painterly touches. Critics hostile to these portraits, calling them 'shallow' and 'boring'. 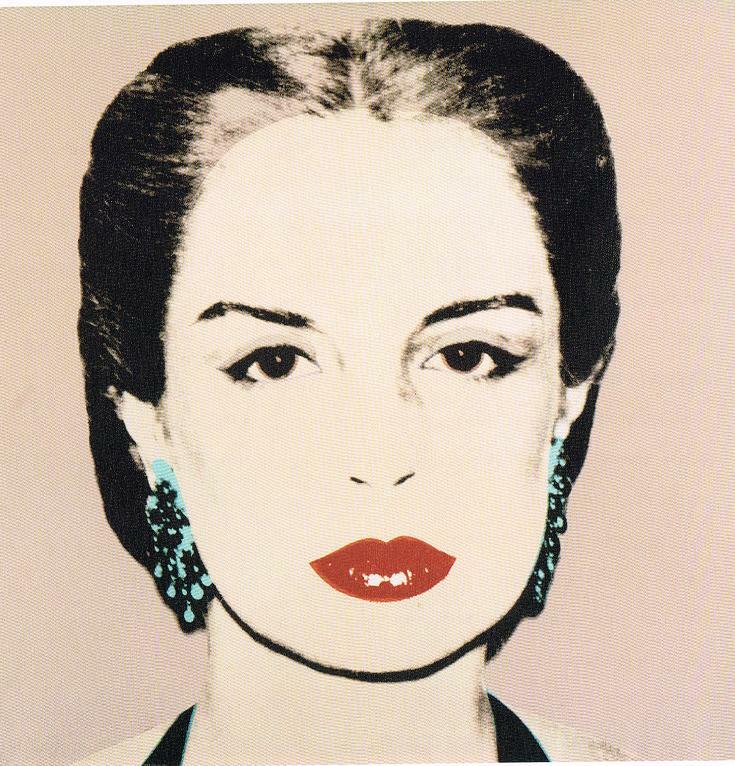 But Warhol defended them as simply society portraits that had been traditional in C18 and C19 - images meant to create a prestigious persona for the patron amongst her society. And if you insist on commentary, you can see them as contemporary society's hunger for fame. Jeff Koons tried to launch an art career in NY in 1980 with assemblages that got no attention. So he tried a different tack. Rather than appeal to the art cognoscenti, he would infuriate them by pandering to the lowest common denominator of banality. He needed something more outrageous than Warhol's camp, so he stooped even further, into kitsch. In 1986 he began employing skilled craftsmen to make luxury versions of junk - large stainless steel or porcelain models of images such as Michael Jackson and his monkey, or the Pink Panther.